The HMV Institute is open for business. Digbeth’s historical venue has hosted tea dances to techno and most things in between. But previously marred by management issues, crippling maintenance costs and an awkward layout to capacity ratio, the prominent Eastside venue has changed direction more than most in the city. Now with three bold new letters in front of its original moniker the Institute’s doors have reopened, marking the latest venue assumption in HMV’s bid to diversify. 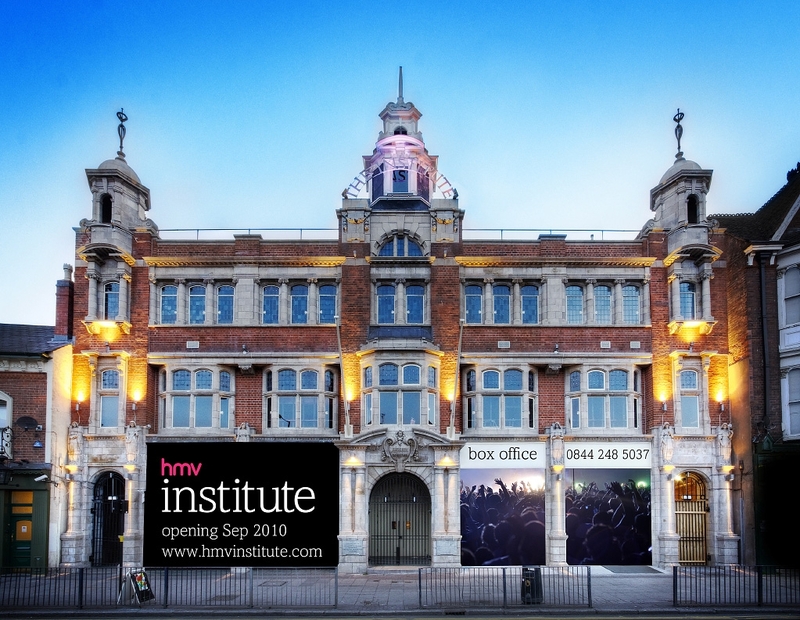 Combining club nights with live gigs, the new look HMV Institute promotes itself as a ‘contemporary multi-space theatre’ with an ‘unrivalled capacity’, able to house ‘big-name international artists to emerging local talent’. The reality is much as before, with the main auditorium holding a 1500 capacity including balcony seating, a stand alone rear venue (formally the Dance Factory) holding a 600 capacity and two internal rooms of 300 capacity a piece. However the line up has changed, with significant live acts booked until the end of the year and Angel Music Group’s hugely successful Eclectricity club brand heading up the dance music schedule. Artists including Brandon Flowers, Fyfe Dangerfield, Mark Ronson (and The Business International), Kelis, Kele and Klaxons will all play headline gigs before Christmas. Managing the HMV Institute is Andy Macdonald, freshly coaxed from the HMV Institute’s default rival, the 02 Academy Birmingham. “The hmvinstitute is going to be an amazing landmark venue for Birmingham and the West Midlands,” states Macdonald. “I feel sure that its versatile spaces and wonderful new amenities will make for a remarkable live environment that will excite fans and will encourage artists to return time and again as a favourite stop in any tour.” Macdonald will have gained valuable experience and industry recognition from his tenure across town, and in his previous role as Operations Director for the DHP Group, although his full agenda for the HMV Institute is yet to be announced. In charge of the listed building’s ‘long-term, multi-million pound refurbishment’ was Steve Forster, MD of the HMV owned MAMA Group’s Live Division. “I feel this venue can become something special,” states Forster, “not least because we have brought a wonderful old building back to life. I would like to thank everyone on the team for working so hard to make it possible,” he continues, “including Birmingham City Council for their valued support.” The Birmingham Observer cannot clarify the extent of Birmingham City Council’s involvement. But with previous planning restrictions reportedly hindering commercial operations, BCC’s ongoing support will be a substantial asset to whoever is responsible for the venue.